Momentum’s digital development focus is emphasized by our Google Partnership and being a Facebook Blueprint for Business agency. Earned and paid social media, SEO, AdWords search and display. We can ensure measurable results because we use the best digital practices in reaching specific audiences to get your message delivered. Message are researched and tested in order to ensure the most engaging digital campaign. MomentumBoost.com targets your audience by their behavior, their location, their expressed interests, and other demographics. We reach them through mobile apps, Facebook, Instagram, and Google. In addition, we use a variety of other platforms from LinkedIn to Twitter and YouTube with success. Our experience includes local and national digital campaigns, targeting B2C and B2B profiles for various-sized organizations. Information. Your information. And lots of it can work to your benefit. Some of the very best brand uplift and lead generation efforts come from content marketing rather than “spin.” We write, edit and produce a combination of authentic and thoroughly researched content. We write, create custom-designed videos and online publications and connect the content to related groups and organizations with social media. 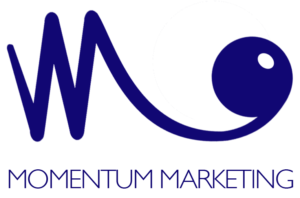 Momentum Marketing gets you there by creating content for your website in order to increase search engine optimization. Then we share clips across multiple social media and other digital channels while leading people back to you. Listening carefully and examining the data help us develop the right game plan and strategies. Do you need to develop a clearer mission or vision statement? Need to brainstorm and sift through ideas for the most effective and current ad campaign? Looking to find a way to improve company culture in order to your staff engaged? Let’s discuss your needs and set up a one-time session, a short-term series of meetings, or a monthly plan to build momentum. Paid search advertising is a way to drive more traffic to your site when people are looking for you – or for your competition. We make sure that your name comes up when people are searching for brand-ambiguous terms. Make sure your brand and messaging and contact information are all clear and useful to your prospects when your business appears in a Google Location Search Result. It’s there – even if you’re not managing it. So, we’ll help you claim and control and use it for good. Whether you’re a B2B or B2C or nonprofit, your organization exists on Facebook, again – even if you’re not managing it. We’ll help you get control of your page. We can also utilize FB to accentuate SEO efforts, plus target your audience with boosted posts and paid ads. Your LI company page may not exist or may be dormant. This is an often-under-utilized tool which can help your SEO. Plus, in addition to HR recruiting, LI can be used to target specific audiences. Firstly, video gives our eyes a rest from the overabundance of textual information we find online. It’s part of the reason audience-video engagement in 2018 is up to 78% every week, and 55% every day. Secondly, you can consistently keep a mix of high quality and more affordable production consistently in your promotion. REPUTATION MANAGEMENT – SEO and Search Results are increasingly dependent on reviews. INSTAGRAM MARKETING – We offer more image-centered content and targeting. GEO-FENCING – Target an audience in specific geographic locations, send them ads, and measure.